As the sun comes out, so does the Copenhagen crowd – even if the temperature is just closing the 10 degrees. There are many parks in Copenhagen, some of them visited more often than others – people will tell you that The Kings Garden is the place to be, but I beg to differ. I like a park that feels like a park and not just a patch of green. 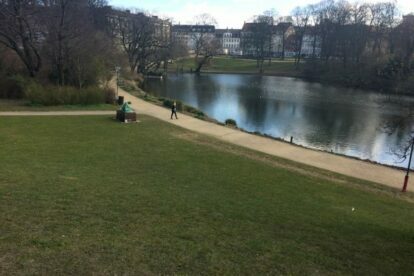 In H.C. Ørstedsparken you’ll find a lake, grass banks in the sun and walking opportunities in between the trees. Go to Torvehallerne, get a coffee, pizza or bottle of wine – whatever your poison is – and bring it with you away from the tourist crowd and into the park. Take a break from the bustling streets of inner Copenhagen, in inner Copenhagen. The only thing you have to remember is not to walk through the park at night – not alone and not in pairs. It has a reputation of being the park where especially gay people hook up at random at night and a fair share of rapes have been reported. The crowd changes as the sun disappears, so just stay clear at night.